The trailers and promotional activities for the film have created a huge buzz around the film and Rajasekhar looks striking in the role of an officer. Actor Rajasekhar, popular for movies like Allari Priyudu and Ankusham, was last seen in Gaddam Gang in 2015 which was a dud at the box office. And the actor hasn’t had a great run at the box office too with his previous releases. Rajasekhar is now back in the scheme of things with PSV Garuda Vega which is directed by acclaimed filmmaker Praveen Sattaru. Said to be an action thriller, PSV Garuda Vega will have Rajasekhar playing an NIA officer who is on a mission and countering terrorism. The film is shot across various places in Europe and is said to be visually dynamic. PSV Garuda Vega is releasing today, November 3rd, 2017 worldwide and has received a great opening in the cinema halls. The trailers and promotional activities for the film have created a huge buzz around the film and Rajasekhar looks striking in the role of an officer. PSV Garda Vega seems to have received a thumbs-up from audience and critics, going by the repotrs on social media. Twitter is abuzz with appreciation for the film, actor Rajasekhar and director Praveen Sattaru for great performances and intriguing story. The film seems to have been impressed with the film and the performances, and are praising the actor, Rajasekhar, for the choice of the subject and role. Besides Rajasekhar, PSV Garuda Vega also stars Pooja Kumar, Shraddha Das, Adith Arun and Kishore in important roles. 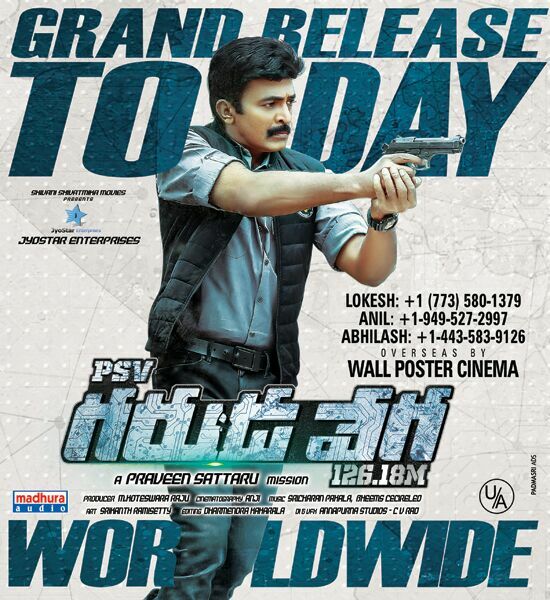 Liked #PSVGarudaVega. Good stuff by Praveen Sattaru and team. #PSGarudaVega is very gripping with Top notch Technical values.Good comeback by @ActorRajasekhar. #PSVGarudaVega A slick action thriller. Has some riveting episodes in the first half. Is made with rich production & technical values.